It’s been a good year for Evil Hat Productions and Cat based RPGs. Atomic Robo: The Roleplaying Game is one of the best new titles of 2014 and by far my favorite use of the Fate Core System so far. Meanwhile, 2014 has also been the year of RPG with cat based protagonists. Cathulhu for Chaosium’s Call of Cthulhu was remixed and released as a supplement. We’ve also seen Call of Catthulhu Deluxe get released (although I am still waiting on my physical box set of the game!) which is a more newcomer/family friendly game that Cathulhu. Heck, earlier this month Strays (which uses the Fate Accelerated Engine) was funded over at Kickstarter. So if you’re in the mood for taking on the role of an animal trying to stop nefarious types and creepy crawlies, you’re got a lot of options right now. The Secrets of Cats was crowdfunded via Patreon which is crowdfunding along the lines of regular payments ala NPR or PBS rather than a single lump sum in the way one funds on Kickstarter or Indiegogo. Currently Evil Hat has 644 patreons, which means they’re bringing in a little over $2,500 per Patreon release if you just use the minimum suggest amount of four dollars. Now I bring this up only because if that is all Evil Hat raised for The Secrets of Cats I am SHOCKED, because the art alone is some of the best I’ve seen in a RPG this year and the writing is pretty top notch too. So although this is currently a “Pay What You Want” piece that you can get for free if you choose to be a skinflint, this fifty-two page supplement for Fate Core really does deserve to have a MSRP of at least twice the suggested rate because it’s that fantastic. Let me get the praise for the art of the way right now. The wonderful cartoon designs of Crystal Frasier really made this piece come to life for me. It’s cartoony and yet dark at the same time. 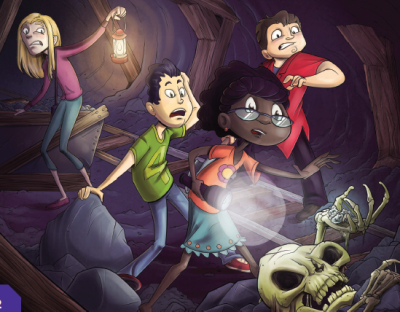 I felt the book gave off a modern, friendlier Ralph Bakshi meets Cartoon Network style and the art alone will make you want to throw money at Evil Hat for this supplement – even if you don’t own the core Fate Core System book. 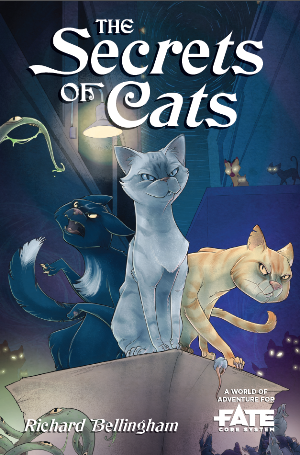 I normally try to avoid making any reference to the name of a specific creator or artist in a review because I’m critiquing the body of work rather than a specific person, but the art in The Secrets of Cats is some of the best and most original I’ve seen in a RPG all year and I will be shocked and horribly dismayed if this isn’t on our short list for the “Best Art” award come the end of the year. So yes, buy this thing just for the art and then go back and get the Fate Core System handbook. It’s that good. So let’s talk about the meat of the supplement now. As this is a supplement, you will need the core rulebook for Fate. Make sure it is Fate Core and NOT Fate Accelerated as they are two slightly different systems ala AD&D 2e and Basic D&D. You can still make The Secrets of Cats work with Fate Accelerated but it does take some work on the part of the GM. The supplement does assume you already have Fate Core and are familiar with the both the rules and jargon of the game, so if you pick this up without it, you might find some (well, a lot) of the text in the character creation section to be gobblygook. Part 1 is “The Duty of Cats” which serves an introduction to the supplement’s concepts and themes. In like most games with animal protagonists, the cats in The Secrets of Cats are actually protecting the world, and specifically humans, whom they call “burdens” from the secret evils that lurk in the shadows. Spirits, dark fae, boogeymen and other fiendish thingies are all real, but mankind (burdenkind?) are oblivious to. There is also the concept of sapient animals, which follows Descartian philosophy. It’s odd that the text states that sapient thought can vary wildly between species. Some (humans, cats, crows and raven) are almost all sapient but then dogs, squirrels and mice are mostly instinctual. I would have liked some insight as to why those species were chosen as examples of each, but I didn’t get it. The good thing is that is someone REALLY wants to play a chicken hawk or a gerbil, they pretty much can with this supplement. Examples of sapient owls, bats and rabbits are given in the text, but remember – the game is primarily about cats, even though I like the option of a rabbit protagonist. You also learn that cat based magic relies heavily on sacrificing other life forms. This might squick some people out and I’m sure the Jack Chick type people of the world will point at this aspect as proof that “RPGS AM SATAN WORSHIP,” but it makes sense in the context of the game and why cats sometimes kill things without eating them. Of course, there’s no correlation for how an herbivore would use magic, but this is The Secrets of Cats after all. Perhaps if this does well enough, we’ll get an additional supplement for other species. Part 2 is “The Naming of Cats” and it is purely character creation. 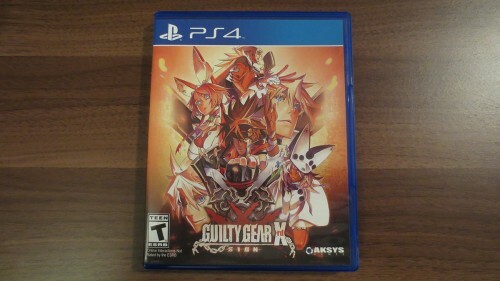 Again, newcomers might be a little lost here, especially if this is their first exposure to Fate, but people who have played any other version of the game will plow right through this as it is almost instinctual. Making a cat character is very similar to a regular Fate character except The Secrets of Cats> has its own magic system and some slight modifications. The section gives you some reminders on cats and how they are not human, so they see and hear things differently, can’t read and are easily distracted. You have to pick your High Concept (personality), your Trouble (character flaw) and your Burden (Human or humans you protect). You pick your skills, each with a rating of +4 to +0. If you are new to Fate each + in your skill is an automatic success. So if you have a +3 in Investigate and you need five successes for a specific action. You only need to get two more +s from your die roll. If you have a +0 in Investigate, well, you’re in for a harder time as you only get four dice to roll. It’s not impossible though! You have four types of magic: Warding, Seeking, Naming and Shaping. They’re all pretty self-explanatory and you can learn more than one sphere of magic. However, you can only master a single sphere. Master of a sphere get some exclusives stunts and spells, so it’s worth doing at some point. You don’t HAVE to do it at character creation time. Stunts are essentially your special abilities and talents. You get three regular stunts relating to your non-magic skills and another three magic stunts. So your character is pretty well rounded from the start. There is no discussion on character advancement in this supplement so I have to assume it is the same as in regular Fate Core. Part 3 is “Silver Ford” and it’s the campaign setting for this supplement. Silver Ford is a small tourist resort town in Maine which happens to have more than its fair share of ghosts. This section is really short, details some story seeds and primary locations for the town, but really, it’s just window dressing for Part 4. Overall,The Secrets of Cats is fantastic and left me wanting more, even though I probably won’t get it. 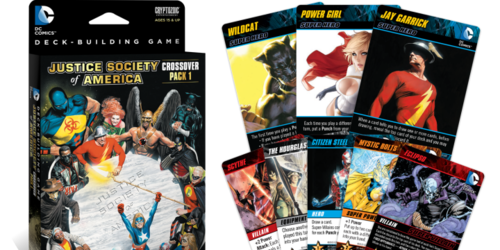 The concept is a fun one, even if we’re being hit with a deluge of cat oriented RPGs this year and the artwork really makes this supplement stand out. I do wish there was a little more substance here as there is a lot more than can be done with the ideas presented here. As a freebie, this is a no-brainer. However I do have to strongly suggest that you throw SOME money towards Evil Hat (and not just because they’re local to the Washington D.C. area as well) because it’s that well done. I’m looking forward to seeing what else comes from Evil Hat’s Patreon project because if the other releases are half as good as this one, they’ve got a winning formula other companies are going to start duplicating. Hi! I’m the author of “The Secrets of Cats”. I’m glad you enjoyed the book, and I hope you have a great time playing it if you get a game together. If people don’t want to buy the main Fate Core rules (though I encourage it!) there’s a System Resource Document (http://fate-srd.com/) that will give you everything you need to learn and play the game. You mentioned “Catthulhu” in your review and I’m pleased to tell you that “The Secrets of Cats” is now available in a bundle with “Catthulhu” and John Wick’s “Cat”. Buying the bundle gives a substantial saving on all three games (http://rpg.drivethrustuff.com/product/134966/Bundle-Of-Kitties). Yes, the game uses the standard advancement system from Fate Core. I don’t know if Evil Hat will ever produce more material for this setting (though I’d love to work with them on it if they did), but if there’s enough interest I’m thinking about setting up a Patreon campaign to fund extra material. The budget for “Secrets” was about $3,000 dollars thanks to the money raised from the Patreon and that meant that the word count and art buys were limited. I had to squeeze a lot of things into the book to fulfil the goal of the Patreon to provide worlds AND adventures (and still overshot by a couple of thousand words). I tried to give as many suggestions and implied setting details as I could (for instance the sapient animals in “Black Silver” that give some idea of what other animals are like) but there’s a lot of room for future development. You asked about rabbits and herbivore magic. Most rabbits aren’t sapient, but there are some who are. Some are individual sapients leading warrens of their less enlightened kind but others end up leaving their birth warrens to travel the world, and sometimes they meet up with other sapient rabbits to found their own warren. In those cases, the entire warren is made up of sapient lapines. Lapine magic is shamanistic in nature. When a rabbit shows an aptitude for magic she eats certain leaves and berries and goes on a totem quest (essentially Astral Projection as per the Seeking power). 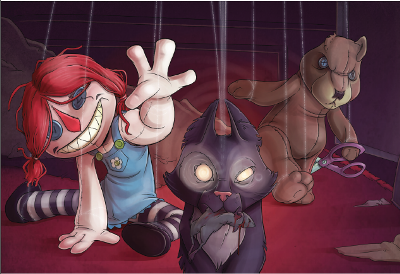 While on this quest the rabbit meets many dangerous spirits and strange situations and must win her way through. If she succeeds, she meets a spirit who matches her fundamental personality and enters a bargain with it. Most rabbits bargain with spirits of nature or the elements–growth, plants, wind, rain, fire. Some instead find urban spirits or emotion spirits, with a very few twisted lapines joining forces with ghosts, spirits of death or decay, or spirits of hatred or pain. Once a rabbit has bonded with a spirit, she becomes its anchor. If the spirit is ever killed it will reform at her location some time later. In exchange for providing the spirit this protection (and ability to interfere with the mundane world), the spirit lends its supernatural powers to the rabbit. From then on the rabbit can tap into her totem’s spirit stunts, using them for herself. She must pay the stress to activate each stunt, using her own bodily strength or sanity to fuel the magic in place of the spirit’s own essence. From time to time the spirit will provide the rabbit with information or ask her to perform services for it. If the rabbit fails to keep up a positive relationship with her spirit then eventually their bond will sour and the spirit may directly attack her or engineer harm to befall her. And now you’ve got me wanting to run The Secret of Nimh. For a 3K budget this is an amazing piece of work. And that it’s going to get a print release is fantastic. Much as I’m trying to go electronic only for my gaming, Fate seems to have crept onto my shelf. I love the rabbit addendum you put in your blog today. That was unexpected and adorable. Thank you so much for that. You’re welcome. It seems I got my Latin slightly mixed up this morning though; it should’ve been Leporine, not Lapine. Lapine is the French word for a doe rabbit, which may be where my confusion came from. It’s also the language given by Richard Adams for the rabbit language in “Watership Down”. Hi Alexander! I just launched the Kickstarter for “Animals & Threats”, a 10,000 word add-on book for “The Secrets of Cats” that has rules for magical rabbits among other animals! Check it out and perhaps back it and spread the word if you like what you see?